Ten-year-old Victor - who lives in Ronchin, near Lille (Hauts-de-France) - created the association “Feutres et Compagnie (Felt Tips and Company)" - one year ago, with four other school children: Emma, Samantha, Pauline and Lilya. The association offers many of the most-needed school items, including pens, felt tips, folders, notebooks, and dictionaries. In just one year, the group has collected over 1,300 kilos of items, and distributed them to families in need. 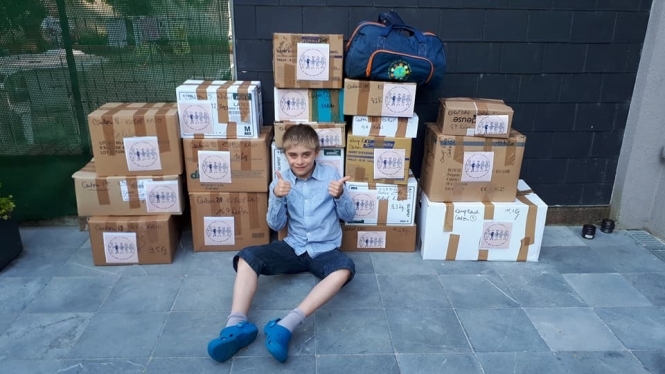 Local families were the first recipients, but the group is now starting to send items abroad too, including to Morocco, Tunisia, and eastern Europe. Last year, after the Irma hurricane devastated the West Indies French island of Saint-Martin, the charity sent over 600 kg of items to children in need there, thanks to the support of the Territorial Army and postal service Chronopost. Victor came upon the idea last year when he realised, in CE2, that many of his fellow pupils had “rather empty pencil cases”. Victor’s mother said she did not realise the group would become such a success. She said: “There are people everywhere in France who have sent us items [to help out] - people from Brittany, Normandy, Toulouse, Savoie. There is even a woman who sent us pencil cases that she herself had filled. We didn’t realise we would have a house and a garage full of items!